The TEAS Test Boot Camp for Nursing and Allied Health Majors will be Friday, Sept. 7 (session one) and Friday, Sept. 14 (session two) from 1-5 p.m. on the second floor of South Hall. This will be four hours of intense must know information. Participants will receive study tips for test success and review material on each TEAS section. The fee is $50 for pre-registration and $75 on the day of offering. The instructor is Amy M. Garcie, DNP, RN, CNML. The Security+Intensive Boot Camp is online/open enrollment. This intensive boot camp is designed with one thing in mind: Certification. In this course, you will study, at your own pace, for the CompTIA Security+ (SYO-501) exam. You will be provided resources, lecture notes and access to a live professor that will prepare you to take the certification exam. This comprehensive package includes the software, recorded lectures, a test voucher and a free retake, and a weekly live session. This course is self-paced so that you may begin any time and will have 9 months of live access. The fee is $1,899 and the instructor is Eddie Horton. The Phlebotomy Technician will be Sept. 10-Nov. 5 on Mondays, Wednesdays and Fridays from 6-9 p.m. on the second floor of South Hall. Fees are $850 plus $125 and the instructor is Sherry Hinton, CPI. The seven week course includes five weeks of classroom instruction and two weeks of clinicals. It is designed to teach entry-level phlebotomy skills to students interested in pursuing a career in Phlebotomy. Students are required to complete 100 clinical hours and 100 venipunctures before they will be allowed to take the board exam. Upon satisfactory completion of this course, students will be eligible to take the National Board Certification Exam on site through the American Certification Agency for Healthcare Professionals. This course also includes Basic Life Support (BLS) Certification through the American Heart Association. The Playing in the Mud: Beginning Ceramics course will be Sept. 13-Nov. 15 on Thursdays from 6-8 p.m. in Room 113 of CAPA. This course is an introduction to working with clay. The student will learn hand-building and sculptural techniques, as well as work on the potter’s wheel. There will also be room for intermediate and advanced students to take the class who want to use the facilities during the class time. The fee is $150 plus $20 material fee. The instructor is Matt DeFord. The Family and Friends CPR course is Saturday, Sept. 15 from 8-10 a.m. in Room 118, Fournet Hall. This course teaches the lifesaving skills of adult hands-only CPR, child CPR, adult and child AED use, infant CPR, and mild and severe airway block for adults, children and infants. It is for people who want to learn CPR but do not need a CPR course completion card to meet a job requirement. This course is ideal for community groups, new parents, grandparents, babysitters, and others interested in learning how to save a life. A Certificate of Participation will be provided at the end of the course. The fee is $10 plus $5 material fee. The instructor is Amy M. Garcie, DNP, RN, CNML. 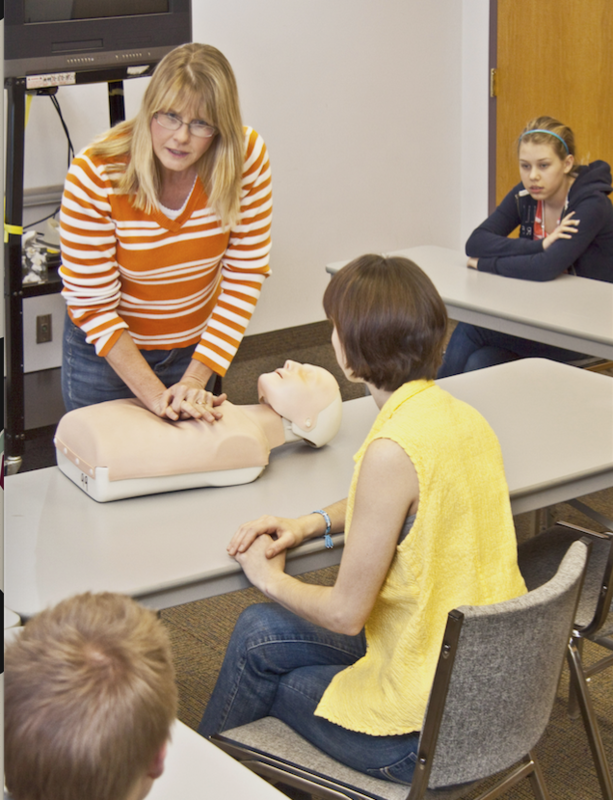 The Basic Life Support course is Saturday, Sept. 15 from 11 a.m.-3 p.m. in Room 120, Fournet Hall. This course is designed for healthcare professionals and other personnel who need to know how to perform CPR and other basic cardiovascular life support skills in a wide variety of in-facility and pre-hospital settings. The fee is $30 plus $15 material fee. The instructor is Amy M. Garcie, DNP, RN, CNML. The English for Everyday Living class is Sept. 17-Nov. 14 on Mondays and Wednesdays from 5:30-7:15 p.m. in Room 318, Kyser Hall. This 8-week class will focus on learning to use English in conversation and in writing, for both formal and informal communication situations. Typical situations include introducing yourself; describing things, people, places, and events; asking and answering questions; taking and giving instructions and directions; counting and measuring. New vocabulary and grammar will be introduced each week and practiced. At the end of the course, students will receive a detailed evaluation of their current English language skills and suggestions for future study. The fee is $49 and the instructor is Dr. James Mischler. The Beginning Cake Decorating course will be Sept. 17-Oct. 22 on Mondays from 5:30-8 p.m. in the Culinary Arts Building. This course focuses on the fundamentals of cake decorating. It is designed for the cake decorating shop owner, baker, caterer, chef or enthusiast. The class will stress classic decorating, beginning with a thorough understanding of the fundamentals. Students will also be encouraged to express themselves creatively. The fee is $99 and the instructor is Mary Paige. The Line Dance class is Sept. 18-Oct. 23 on Tuesdays from 5:30-7 p.m. in Room 127, Health and Human Performance Building. Exercise your body and mind by dancing to lively, upbeat music. Line dancing is a fun way to dance socially without a dance partner. Dancing styles covered in this class will include country western, zydeco, hip-hop and an introduction to waltz and Cajun two-step. The fee is $65 and the instructors are Wanda and Avila Kahey. The Pick Up Your Bush painting classes are Thursday, Sept. 20 (Pumpkin Trio) and Tuesday, Sept. 25 (Falling Leaves) from 6-9 p.m. on the second flood of South Hall. In these classes, you will learn the art of painting using step-by-step instructions to create a masterpiece of your own. No special or prior skill required. Just relax and enjoy each class. Students will take home a completed painting at the end of every class. Children ages 7–12 years old are allowed to enroll, but a parent must accompany the child the entire class. Parent does not have to enroll unless they participate. Each date is a separate session. All supplies included. The fee is $45 per session and the instructor is Shanna Dees Gaspard. The Driver Education (Spring 2019) course will be Jan. 3-6 from 7:30 a.m. – 4 p.m. (Tuesday, Friday and Saturday) and 1-7 p.m. (Sunday) on the second floor of South Hall. This course will consist of 30 hours of classroom instruction and a minimum of eight hours of practice driving (behind-the-wheel instruction). You will receive a certificate verifying successful completion of the course. Please provide proof of age. Must be 14 years and 9 months old, on or before April 3. Registration Deadline is Friday, Dec. 14. Contact the Office of Electronic and Continuing Education for more details or visit checkout.nsula.edu to register. The instructor is Kevin Warner. For more information on non-credit programs, go to www.nsula.edu/ece/non-credit-programs/ or call (800) 376-2422 or (318) 357-6355. To register for classes, go to checkout.nsula.edu. To learn more about online non-credit courses visit http://www.gatlineducation.com/nsula and http://www.ed2go.com/nsu.